Hello pretties! I'm excited to share this news to all of you! It's been such a long time since my last mystery box of the month! Well, I used to share quite a few beauty boxes that I've bought or received but I stopped those subscriptions because... I'm getting poorer... LOL... Just joking... I just felt some products given in the box wasn't my cup of tea and yeah, I've decided to stop the subscriptions. This is something new in the beauty box market because instead of putting beauty products (or samples), it is more lovely to receive accessories which you can mix and match with your daily outfits. 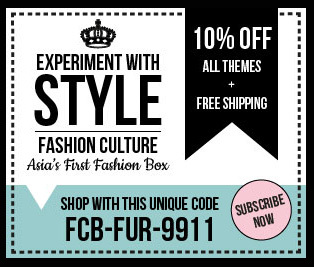 Fashion Culture box introduced three themes of style every month. Each theme has its unique style for you to choose from and you can learn about the themes on the website and Facebook page. Take a look at the previous themes, you get to choose the theme based on your favourite theme or theme that suits you the most. I read some of the reviews mentioned they received pretty accessories from the previous themes and most of them were surprised with the accessories received! When I received my box, the items were well placed in the box. I'm lucky that the four corners of the box were still in good condition after delivered by the postmen. Nevertheless, I also found extra two products in the box: the Shokobutsu Shower Foam and Genesis Pro GumCare toothpaste. The temple of the shades are so cute! The swirl design makes the shades looks more interesting than a pair of usual shades. Next up, the water-droplet shaped earrings. I seldom put on earrings, that's because I'm not good at mix and match my outfits with fancy earrings lol. But this pair of earrings with its little studs attracted me. Spiky bracelet. This is pretty common but this bracelet is more light-weighted compared to the one I found in some of the accessories store. It is stretchable so do not need to worry it get stuck at your wrist. The design awesome right? Very stylish!